This might be one of those times Andrew Wiggins should just fade to black. He recently got into it on IG with Stephen Jackson over the Jimmy Butler situation. When news broke of Butler’s request of a trade from the franchise, Wiggins’ brother tweeted “Hallelujah” in response as an apparent sigh of relief. 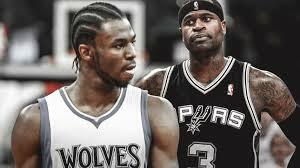 Butler criticized Wiggins and other teammates for their poor work ethic and lack of professionalism. Jackson took issue with the tweet. He recorded a message saying the Timberwolves needed Butler because without him, they’d have no heart. Wiggins responded by calling Jackson a bum and in so many words, telling him to mind his business. Wiggins should rethink this. Stephen Jackson took back to Instagram to pretty much explain that this isn’t going to go in Wiggins favor. If Wiggins was smart he’d believe him. Let’s take a look at Jackson’s track record: Malice in the Palace, choked Steve Francis in a nightclub, got hit by a car going nearly 50 mph and got up and started shooting. This man recorded a video in a drug, expressing how he never thought he’d make it to 40 yrs old and calling you “lil one”. Yeah this one isn’t worth it Andrew. Everything seems to be settled now as Jackson apparently has received some counsel from older players. Andrew Wiggins might want to send Jerry Stackhouse a fruit basket or edible arrangement or something. Jackson said “he’ll see him in traffic”. I have a feeling there would be some road rage involved. Flip the page to see the IG exchange between Jackson and Wiggins.